Vegan Nights takes part in the first Thursday of the month at 93 Feet East on Brick Lane and August’s theme was carnival. As Brick Lane is a short walk from work I always get there early and this time I met up with my friend Maxine and her friend Antonia who was attending her first vegan event! I was a bit miffed when I arrived as I was made to empty my water bottle. In these high heats when we are encouraged to carry water to keep hydrated especially while travelling it is a shame Vegan Nights has this policy. It is especially mad when the first thing we did once entering was go to the bar and get a large glass of free tap water! As always we did a tour of the stalls before deciding what to eat. There are always new stalls that I haven’t seen before and new foods to try! For my main I decided to go for wings n tings from Italfresh a Caribbean stall. It consisted of cauliflower “wings” in a ginger beer batter with slaw and sweet potato fries. The thick batter was really tasty and feels a little virtuous by also have a good portion of cauliflower! Antonia also went for Caribbean from another stall, she had jerk chickn bites with plantain, salsa and slaw. This was Antonia’s first time trying plantain and she was completely sold! This burger looked immense and Maxine got quite messy trying to eat it! We wanted something refreshing and cool and the temperature was still hot hot hot as we went into the evening. I chose a smoothie from Love Shack which had coconut milk, pineapple and ginger. Maxine and Antonia were tempted by the coconut ice-cream served by Elly Joy and it was easy to see why! I couldn’t go out and not pick up something for my Husband. I got him a peanut butter and jelly brownie from Vida Bakery. As the evening goes on it gets busier and busier and the queue when I left was getting quite long. I usually make a speedy exit as by Thursday I’m tired from the week at work and this week I’m also suffering from a sore throat coldy thing. Have you been to Vegan Nights? What did you think? What did you eat? Let me know in the comments below. Well it’s been over a month since I last posted. It sometimes seems like I have loads of events all at once and then none for a little while and I don’t like to post just for the sake of it! When I was out with my friend Maxine a couple of weeks ago she mentioned she was heading to this month’s Vegan Nights and as I free and hadn’t been in a few months I decided to tag along. The event takes place in 93 Feet East and The Boilerhouse in Brick Lane and takes up a much larger space than the last time I visited. This was great as it meant stalls weren’t cramped together and there was a lot more space for seating. I decided to go have tofish and chips with mushy peas from Shakey Shakey Fish Bar. I’d heard of these guys but never been to an event they were at so wanted to try them out. The tofish was great, the batter was crisp and there was more seaweed than I’ve had in other tofish dishes, which gave it that fishy taste. I also really enjoyed dipping my chips in the tartare sauce. They also had deep fried Oreos which I was really tempted by, but they’ll have to wait for next time! Maxine went for a wrap from What the Pitta, I have tried these multiple times and they are always amazing! For dessert I couldn’t resist this mint chocolate ice cream from Hell Yum. Mint choc chip was always my favourite ice cream flavour pre-vegan and it’s one you rarely see vegan versions of. We also tried some samples of Hell Yum’s cookies which were delicious. They also do ice cream cookie sandwiches but I was far too full for that! There’s always two cake stalls I have to purchase something from. I picked up a Viennese Whirl from Vegan Delice and a rainbow cake along with a couple of brownies (peanut and caramel) for my Husband from Vida Bakery. These went down a right treat! I managed to make one none food purchase as well. This gorgeous T-shirt from BCLVA (I couldn’t find a link for them, sorry!) for only a fiver! Maxine picked up a couple of different designs too. I think it’s gonna look great at activism events! We also had a little boogie to DJ Deccy Jarrett in the bar area before I decided to head home. There were so many other places to try out, I think I’ll definitely have to back next month! I’ll finish with this photo of Maxine and I showing off our vegan ink! 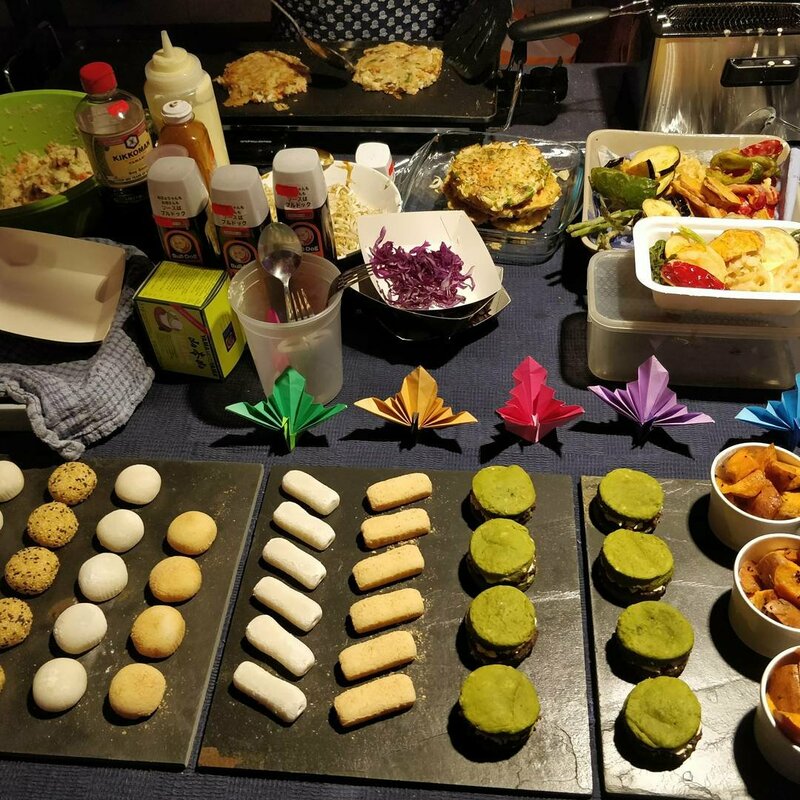 Did you visit Vegan Nights this month? What did you think? What did you eat? I really enjoyed the first Vegan Nights event at the Truman Brewery in Brick Lane which I wrote about here so I had to go back for part 2. Unfortunately I didn’t have much time as we were leaving for our weekend away straight after so I dashed in grabbed some food and dashed to the station to meet my Husband. I had looked online as to who was going to be there and was glad to see there were some new additions. I’ve been wanting to try Shakey Shakey Fish Bar for a while but thought the chips would get cold on the walk back to the station so I’ll have to get down to the boilerhouse one weekend to try their deep fried Oreos! I was excited to see the Japanese stall from Hai Dozo so I went for their okonomiyaki which is an omelette filled with vegetables. They also had lots of sweet treats which I’ll have to try next time. 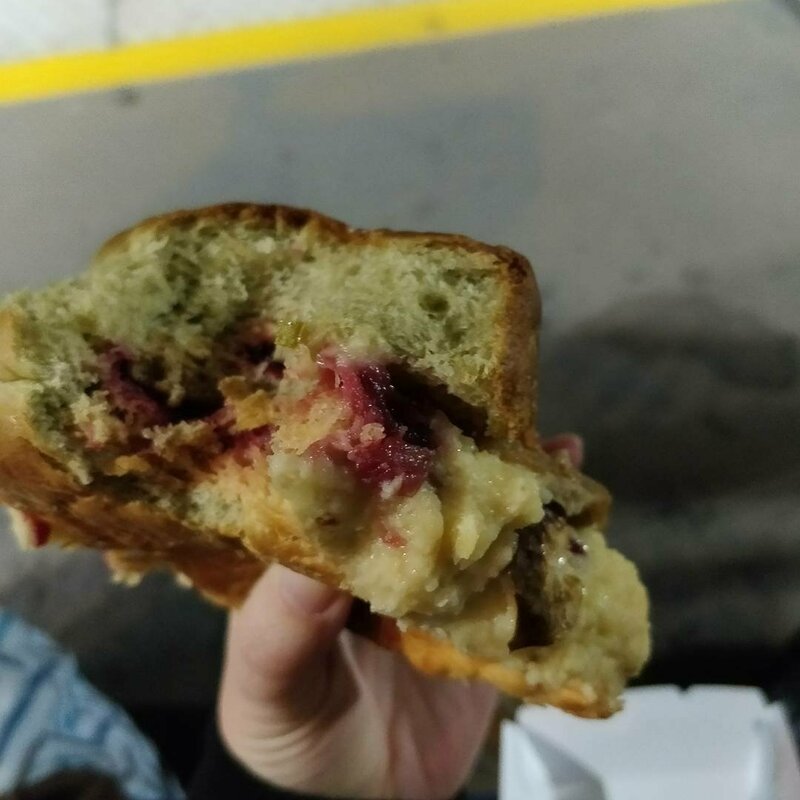 I also had to get a Santa burger from Pomodoro e Basilico which came with mashed potato, Brussel sprouts and cranberry sauce. I didn’t get a good picture as my Husband had already taken a bite before I could snap it! 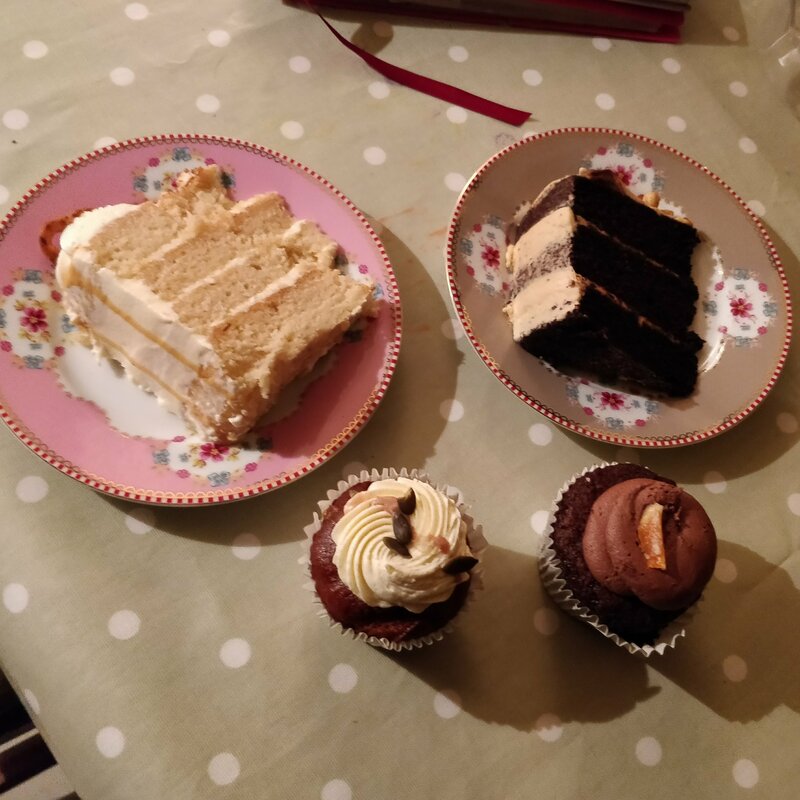 No vegan meal is complete without cake so returned to my faves Venezuelans Dani and Vane at Vida Bakery and got some peanut butter chocolate cake, caramel vanilla cake, pumpkin spice cupcake and chocolate orange cupcake. We enjoyed these once we arrived at our holiday cottage. I loved the pumpkin spice which reminded me of carrot cake. So that was my whirlwind visit to vegan nights, I was in and out in 20 minutes. If you go to a future event I would recommend getting there as early as possibly as the queue to get in only gets longer! Did you go to vegan nights 2? What did you eat? What did you think? Let me know in the comments below. This week I was lucky enough to attend the first Vegan Nights market at The Boiler House, Truman Brewery in Brick Lane. I had looked up which traders were going to be there and planned which food I definitely wanted to eat! I started off with the Father Jack burger from Biff’s Jack Shack. It had a jackfruit burger with onion rings, smoked cheese and bourbon barbecue sauce, the container even had a sticker with Father Jack (from Father Ted) on it! This burger was so tasty and I’ll definitely be seeking out Biff’s Jack Shack again! Next on my hit list were Pomodoro e Basilico where I grabbed a slice of Cisa pizza which came with pesto and chorizo. I’ve tried this before and it was definitely as good as I remember! Next I was ready to move on to the sweet stuff and when I saw the Freakshakes Mylkman were producing I knew I had to try one! I went for the Top banana which consisted of frozen banana, peanut butter and loads of goodies on top all served in a hollowed out pineapple! I had strict instructions to bring home a treat for Husband so I headed over to Vida Bakery’s stall. I went for this peanut and chocolate for him which I knew wouldn’t disappoint. Taking a break from the food I headed over to the Bright Zine stall. I had already read their first zine so I was looking forward to picking up the next couple of issues, I also got this great stickers! The stall I was most interesting in visiting weren’t there when I first turned up and I was worried they might have had to cancel but I had no need to worry as I soon saw Vegan Delice bringing in their wares. I first tried their cakes when I visited Hackney Downs Vegan Market which I wrote about here. This time I was after their hot donuts which they didn’t have at Hackney and I wasn’t disappointed! It’s been a long time since I’ve had a donut like this and it was very tasty! Here’s a selection of the other options available on the night. There were so many people there and I was lucky to get there as early as I did. When I left I saw the queue to get in which had well over 100 people in it and they were operating a one out, one in policy! I hope this becomes a regular event as there is definitely the demand for it! Did you attend Vegan Nights? If not which stalls would you be most excited to try? Let me know in the comments below.